The sleek design of the AXD Mount covers innovative gearing. for superior performance. 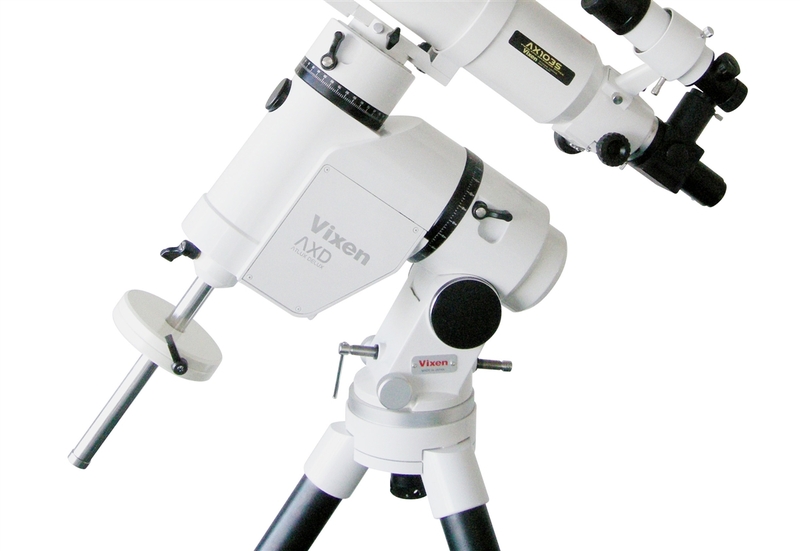 The sleek design of Vixen's AXD Equatorial Mount covers innovative gearing for superior performance. Avid astronomers will find that the high performance and precise tracking of the AXD Mount will raise their level of astrophotography. With its ease of use and superior performance, the AXD Munt offers even novice astronomers the opportunity to be a successful astro-photographer. Controlled by Vixen's new STAR BOOK TEN, the AXD combines all the features that the serious astronomer has been waiting for. 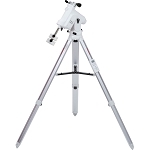 The AXD Mount was names a 2011 Star Product by Astronomy Magazine. Read what .Astronomy Magazine wrote about the AXD Mount. TEN in Japanese means "The Heavens" and this mount will get you there with ease. With observatory quality controls, popular objects appear on the High Definition screen and the AXD "SEE-TO" Technology shows you the sky before the GO-TO sends you there. 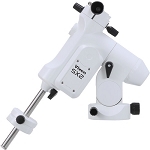 With the ability to zoom to any area you can easily find your target object. When you have viewed all 270000 objects, you can enter and save your own discoveries. No computer needed with the STAR BOOK TEN. Add the Advance Unit, ann expansion unit designed for the STAR BOOK TEN controller. The installationof the Advance Unit in the STAR BOOK TEN controller enhances your autoguiding capabilities. Withthis unit installed you can view an image from a CCD-based imaging camera, record to or play back from a SD/SDHC card and adjust the shutter exposure controls of a DSLR camera. 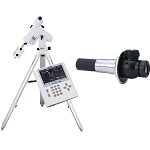 The new Astro Imaging capabilities of the STAR BOOK TEN include integrated video imaging and Video Auto Guiding. With the Zoom In feature for guiding and planetary observing, you can lock on an object, capture the image, and save it to stack later. The full metal construction of this observatory quality mount incorporates bronze 135mm 270 tooth RA Gear and 21 Needle Bearings (13 on RA Axis & 8 on DEC Axis). 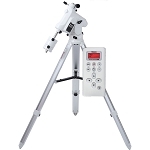 With all these features and Permanent PEC, Night Vision Mode, and a 270,000 Database the STAR BOOK TEN with the NEW AXD Mount is a revolutionary design for telescope mounts. Covered by Vixen's 5 Year Warranty and manufactured in Japan. Sturdy yet Light Weight: Strong and durable A7075 Aluminum Alloy is used for the R.A and DEC axes on the AXD Mount. The A7075 material is stronger than titanium and has a specific gravity 38% less than titanium. This makes the AXD Mount very sturdy but easily transported. Smooth Movement: A total of 21 bearings are used in the mount's movable parts, for smooth movement and precise slewing of the AXD Mount. Advanced Motor Layout: The built in R.A. and DEC motors are placed in he lower part of the declination body on the AXD Mount. This brings the center of balance of the declination body under the crossing point between the R.A. and DEC axes and serves as a portion of counterweight. Moreover, the short distance from the crossing point to the mount head is a configuration designed to lighten a heavy counterweight. VPEC Periodic Error Correction: The periodic motions of each AXD Mount are individually measured at Vixen's factory for accurate performance and precise periodic error correction. The periodic error, which is measured by the VPEC, is recorded on nonvolatile memory inside the mount and it is not lost when you turn off the power. This is a great advantage to both the novice and experienced astrophotographers, enabling you to take impressive astrophotographs with less likelihood of failure. 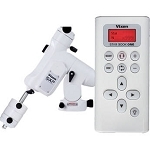 Both PEC and VPEC can also be added by the user to raise the tracking accuracy as the occasion demands. M inimum Backlash: The stepping motors control the rotation of the gears from low to high speed by means of Vixen's unique micro-step motion control system,. This eliminates the need for numerous reduction gears in the motor gear train resulting in excellent decrease in backlash.